A fully tailored car mat set. Made specifically to fit the vehicle listed only. For MK 5 Models With Round Clip Locators. Fit very nicely in my 2015 Polo, although a really tiny bit too big. I'm talking millimetres here. Good value for the price. Would recommend instead of paying more than twice for VW's originals. Within 5 days of placing the order for a set of mats for my new VW Polo I was fitting them into the car. They fit a treat an look very smart. 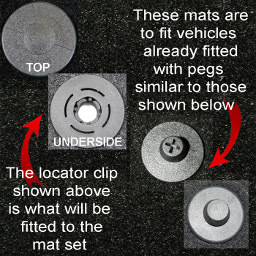 Click the button below to add the Volkswagen Polo Mk5 (2009 to 2017) Tailored Car Mats (round clips) to your wish list.